Was your home built full of hard-to-reach light switches? Is there a switch at the end of a long dark corridor you’d feel more comfortable using from a distance at night? If so, you need to add remote controls to your lights! Remote light switches work like regular ones but also add the ability to control the lights from afar. This is accomplished in various ways – either through old-fashioned remotes, motion & light sensors, or an app on your smartphone. The most sophisticated remote light switches even integrate into your smart home environment or can become the foundation of one thanks to integrated smart speakers! Choosing the right remote light switch isn’t easy since there are many models which cater to different people. Whether you’re up to date on the latest smart tech trends or need a switch your grandparents can use, you’ll find the perfect remote lighting solution among our top six picks. Easy remote control with a stable connection. Widespread support for 3rd-party smart devices. Built-in Alexa speaker and great companion app. Why settle for controlling the lights with a remote when you can do so with a tap on your phone or even your voice? 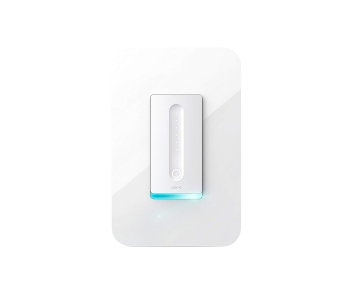 The Ecobee Switch+ is the smartest light switch out there! It has motion and temperature sensors as well as a night light. Best of all, the switch has an Alexa speaker built into it. This lets you control it and other smart devices with your voice, listen to music, and have the knowledge of the internet at your beck and call. You’ll know that this isn’t an ordinary switch as soon as you see its distinct shape. The Switch+ curves and protrudes outwards since considerable space is needed to fit the Alexa speaker. The bottom part acts like a regular switch – pressing it turns lights on and off and should satisfy less tech-savvy family members. The upper portion houses a speaker grill and Alexa’s signature indicator light. There’s also a button on top that turns Alexa off, and a night light at the bottom that can be turned on to guide you in the dark. The best thing about the Switch+ are its diverse remote control options. 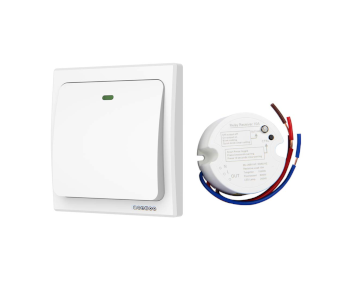 It has built-in motion and occupancy sensors tied to Smart On and Off modes. 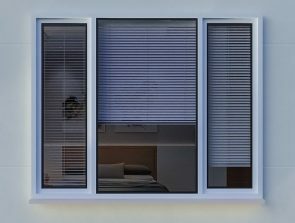 Enabling Smart On engages the motion sensor and turns the lights on once someone enters the room. Smart Off turns them back off when nothing in the room has moved for 15 minutes. More involved controls include using the Ecobee app as a remote or speaking a command to Alexa. 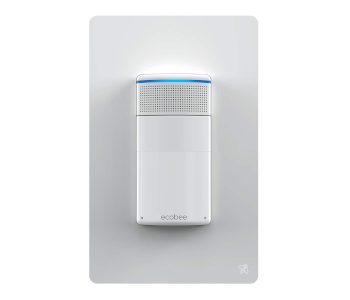 Ecobee’s app is user-friendly and organized – frequent features like Smart On/Off and the night light are accessible from a dedicated screen and can be configured by tapping on them. You’re able to schedule Smart On based on a schedule or sunrise and sunset times. There’s also Vacation mode which activates the lights throughout the day to fool thieves into thinking you’re home. The Switch+ connects to various smart home systems including Apple HomeKit, Samsung SmartThings, and the Google Assistant. It also works with countless smart devices directly through IFTTT commands. Most notable in this respect is its Alexa speaker. Apart from minor omissions like the Drop In feature, it acts like an Echo. The speaker plays music, helps you make shopping or to-do lists, tells you the latest news, or answers trivia questions. ESP is present too, so if you have multiple Alexa speakers the Switch+ will react only if it’s the closest one. The Switch+ can’t dim regular dimmable light bulbs. This feature works with Phillips’ line of Hue smart bulbs though. 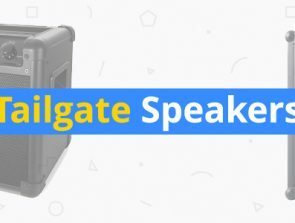 While the speaker is decent, the microphone is terrible. It takes several tries for Alexa to understand you, and you can forget about giving her orders if music is playing. Wemo’s light switch is another smart home device that lets you do so much more than set a romantic mood. Even though there’s no built-in Alexa speaker like with the Ecobee, you can still connect it to one and make lights part of your smart home routine. The switch is straightforward to install, comes with a well-designed companion app, and works flawlessly with other Wemo products. If you already have an Echo and a few Wemo smart plugs, there’s no better option out there! Wemo is known for clever design solutions, and their smart dimmer switch is no exception. It looks like any other elegant switch except for a series of white LEDs at the center and a multicolor indicator light at the bottom. The use of these lights is ingenious – a single white LED tells you the switch’s current brightness level. Touching the switch and going up or down with your finger raises or lowers the brightness! The indicator light changes colors based on your actions – blue means everything is fine, green stands for a successful connection, while red indicates a problem. You’ll need some electrical knowledge to install the switch on your own, but the process is otherwise easy and made even more accessible by Wemo’s excellent instructions. All the wires are clearly labeled, and you’ll be warned in time if you mix them up. A neutral wire is required for installation though, so you’re out of luck if you live in an older house. The companion app is simple to navigate yet gives you nuanced dimming controls and 3rd-party device controls. You can set timers and dimming schedules, turn on night mode to limit the brightness during nighttime hours, and even schedule when lights plugged into the Wemo Smart Plug should work. A configurable long press button feature is also worth noting. This turns connected smart plugs on or off by default. If you use IFTTT to link other smart devices to the switch, it can also be used to execute routines like unlocking a smart lock, raising smart shades, etc. Wemo has partnered up with Nest to support their Learning Thermostat. Connecting the two enables you to turn off the dimmer switch whenever the thermostat enters Away mode. Alternatively, you’re able to set the light to come on at random intervals during this mode to create the illusion of occupancy. The light level indicators are tiny and close to each other, so selecting the right brightness takes precision and a while to master. The switch suffers from frequent connection issues. Having a good router that’s not obstructed by walls helps, but you may still be unable to control the switch remotely at times. Smart light switches can do amazing things, but what if you want to remotely control the lights without having your phone close by? 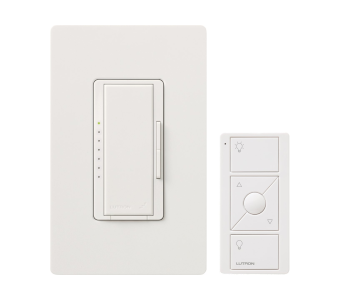 Lutron’s solution is the Maestro Wireless, a dimmer switch which comes with a handy remote. The switch can replace all but three-way setups, is easy to operate, and can be made even more versatile with the purchase of additional sensors. It might be old-school, but the Maestro holds its own both when convenience and reliability are concerned. The Maestro is a minimalistic light switch available in white or almond brown. This makes it an ideal replacement for older switches regardless of your home’s décor. It has a large central on/off button along with two small buttons on the right that control the brightness. A series of green lights run along the left and indicates what the current brightness is. You get a small remote along with the dimmer. This uses Lutron’s proprietary, RF-based Clear Connect protocol. Since there are no beams to aim, you can use the remote in a 100-foot radius, and the dimmer will respond instantly regardless of how many walls or obstacles are between them! This makes Maestro a great option for people who want to turn their porch lights on as they’re entering the driveway, disabled individuals, or anyone with a home where running wires to new switches would be costly. The Pico remote is small and unobtrusive. You can keep it on a table or mount it onto a wall using the included screws. One remote can control 9 dimmer switches! Its battery life is excellent – you won’t need to replace the coin cell battery even after years of use. Lutron offers different optional sensor upgrades. There are models which sense the ambient light level and turn the lights up at sunset. 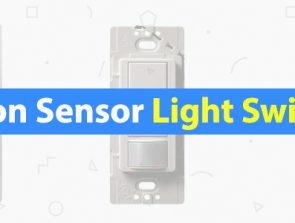 There are also motion sensors and a device that detects both occupancy and vacancy, ensuring that the lights go out once they’re no longer needed. 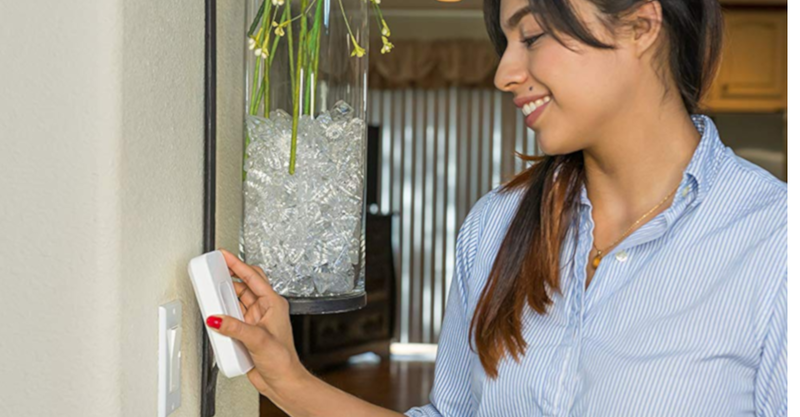 All of Lutron’s sensors feature native compatibility through Clear Connect and require neither hubs nor a smartphone app to work. The Maestro isn’t meant to be used with LED bulbs. Doing so results in flickering at all brightness levels and might lead to malfunctions. The switch also emits a low humming noise. This isn’t a problem during the day but may irritate light sleepers since it is audible at night. All the devices we’ve reviewed so far need to be installed by someone who knows her way around electricity. What if there were a way to make your old switch remote-controlled without having to pay a professional or risk doing it yourself? That’s the idea behind the Switchmate, a clever light switch attachment you snap onto existing switches and can then control them either with your voice or a phone app. This is hands down the light switch with the simplest installation process ever! The idea behind it is ingenious – you place the Switchmate on top of the old switch where it is held in place by powerful magnets. Once activated, the Switchmate uses a small motor to toggle the switch on and off. This produces a slight delay but works every time! You’ll need to pay attention to what kind of switch you have since there are separate versions for rocker and toggle models. After the second-long install, you can control the switch directly by pressing a button, or remotely through the app. This is the most basic app we’ve encountered for a connected light switch. Its dashboard only has an on and an off button. There’s also a scheduling function on a separate screen. Activating it involves setting the date & time when the switch should turn on and then specifying a duration. Using voice commands to control the switch is easy and doesn’t even require an AI assistant like Alexa. You first have to name the light in the app. Then, you can press a microphone icon and say “turn [name of the switch] on or off.” This works well, and the app responds to voice commands without mix-ups. Another cool thing about the Switchmate is that you don’t need to use it exclusively for lights. It works with any rocker or toggle switch, so you can control garbage disposals or outlets that have a safety switch. Since it is so easy to install and move, you can use the Switchmate seasonally – control your fireplace in winter, then switch it to the ceiling fan once summer comes. The Switchmate connects to your phone through Bluetooth. This means you’ll need to be close to it since the connection range drops off sharply the more walls are between the two. It also isn’t as stable as Lutron Clear Connect. The device’s smart features are limited. Alexa support has been in the works for years now, and Switchmate had to drop support for the Wink hub after a firmware update. We all have that one light switch in the house that’s either placed inconveniently or so old that replacing it would cost a fortune in rewiring. Enter the Acegoo Wireless Lights Switch Kit, a receiver & transmitter combo that makes any light accessible through a remote-controlled switch. It might not be as advanced as other entries on the list, but Acegoo’s switch kit does the one thing it is supposed to flawlessly. 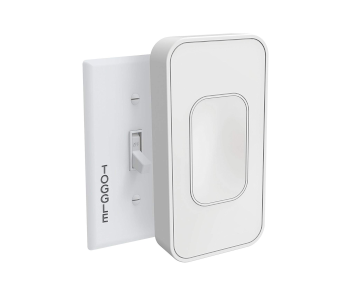 The Acegoo Wireless Lights Switch Kit is made up of two items – a transmitter that connects to your light’s wiring, and a receiver switch that toggles the light on and off from up to 100 feet away. The trickiest part of getting the system to work is installing the transmitter. This puck-like device has three wires which connect to the common, red, and black wire respectively. Installing it should be performed by a licensed electrician. Once the transmitter is connected though, using the light is a breeze. The transmitter sends data to the rectangular receiver that looks like a standard modern light switch. 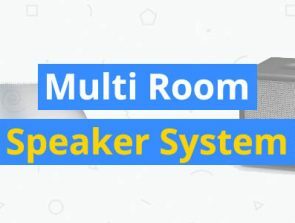 You can use it either as a portable remote or stick it on the wall at a more convenient location with the included double-sided adhesive tape. The transmitter always knows which position the receiver is in, so there’s no need for batteries! The base switch kit can be expanded with additional transmitters and receivers. Connecting another transmitter lets you control two lights at the same time, e.g. a lamp in the hallway and the attic light. On the other hand, adding another receiver is useful for creating three-way switches that control a single light from multiple locations. The transmitter may not fit behind light switches that have tight junction boxes. If the one you’re installing it into is too small, the wiring may be left exposed and present a potential hazard. The manual the kit comes with is vague and may not be enough for DIY-ers. Luckily, there are videos on YouTube which explain how the installation works in detail. There are lots of ways to remotely control the wired lights throughout your home, but what about lamps? Consider the Etekcity Remote Control Outlet Kit if you want to create the perfect atmosphere with lots of ambient lights you can turn off with a button press. 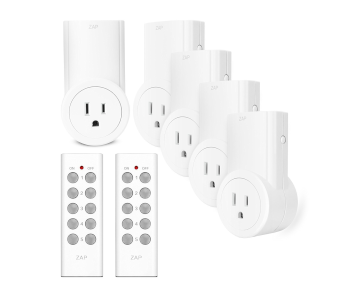 The kit is affordable, easy to install, and the outlets react to commands immediately thanks to radio-wave connection. The Etekcity Remote Control Outlet Kit consists of five outlets and two remote controls. The three-pronged outlets have an extra upper portion which houses the radio antenna and a red LED light that indicates when the outlet is on. Installing them is as easy as plugging each into a standard outlet. There’s nothing to set up since the outlets come pre-programmed. The remote has 10 buttons in 5 rows. Each row has an on and an off button and corresponds to a single outlet. You can tell which outlet pairs with which row by checking its serial number. This ends with a digit between 1 and 5. You can change their order with a series of presses too. The remotes use 23A 12-volt batteries which can last for years depending on the frequency of use. They’re set up so that one outlet can be controlled by multiple remotes and vice versa. A similar concept to Clear Connect is used for this – they communicate through signals on a wavelength of 434 MHz which doesn’t interfere with Bluetooth or Wi-Fi, and the connection is rarely lost. Maximum connection range is 100 feet and unaffected by walls. The outlets are bulky and take up so much space that you won’t be able to plug anything else into the other socket regardless of which one you plug them into. The remotes’ batteries have a cover that’s hard to remove. It’s flimsy as well, so using too much force could break instead of open it.